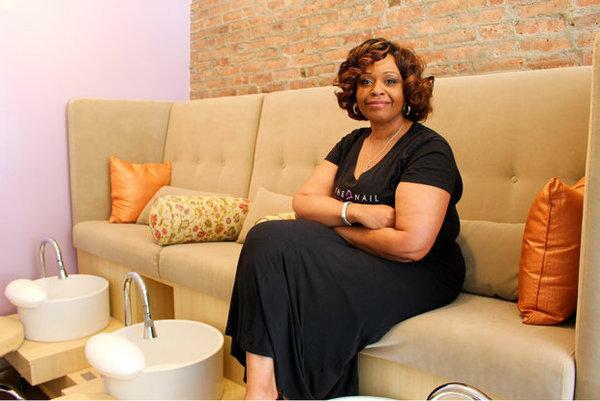 A loan of $10,000 helped the Nail Belle increase its reach through conventional marketing, thus increasing revenue to roll out mobile and in-home services. I was born in a small town in North Carolina and raised to be all things proper Southern Belle. But I always knew that I would someday outgrow southern living because I had Big City dreams. My corporate career of nearly 30 years as an EA would eventually lead me to one of the greatest cities in the world – New York. I grew up in Greensboro, NC in a 2 parent home in tree-lined white neighborhoods with 2 brothers, 2 sisters and a dog named Brownie. My parent's first house was in an upper middle class neighborhood where they unknowingly bought next door to a KKK leader. No welcome wagon came with gifts and coupons to welcome us and congratulate us for breaking the color barrier. Rather, a cross was burned in our yard and my parents were threatened harm if we did not move. Despite the threats my parent's stood fast and vowed never to move, with the only casualty of that decision being the slaughter of Brownie by our KKK neighbor. Years went by, we got another dog and my mother became best friend's with the KKK leader's abused wife. I watched my mother bandage her wounds, apply cold compresses to black eyes and pray for her. She turned an enemy into a friend. But not only did my Mother's compassion make her my hero, she started a printing business on a kitchen table that eventually lead to a commercial space and the opening of her 2nd business, a check cashing store. Beyond compassion was her determination, ambition and strength. All attributes I too possess. From career executive assistant to CEO of my own business are the fruit of my Mother's labor. It supports a woman entrepreneur and her efforts to grow her business in her struggling community. The Southern attributes of good manners and hospitality served me well in my career and opened doors to opportunities with some of the world’s greatest companies – AOL, IBM, Burberry. In 2006 my career brought me to NYC where I was blessed to land in beautiful brownstone Bed-Stuy, Brooklyn. I have lived in the same building every day since. In surveying my neighbors, friends and fellow block association members we all agreed that an upscale nail salon would be the next big thing to hit Bed Stuy. I have witnessed a lot in Bed Stuy over the last 10 years. I’ve seen abandoned buildings become swanky restaurants, neon liquor store signs exchanged for scalloped awnings that say wine store and scone serving coffee shops. But despite these changes I still traveled to Williamsburg and Tribeca for mani/pedi’s. My neighbors and I longed for a nicer nail salon in Bed Stuy and agreed that whomever brought it would be filling a much needed void. Hence, The Nail Belle was born. My discontent for local nail salons prompted me to create the experience I wanted, in my own backyard. Located 5 blocks from my house I have created a warm and inviting space for all to enjoy. I chose vintage décor! A $3500 portion of this loan is requested for rent and utilities to ensure the continuity of business during the cold months when business is slow. Further needed is $2500 to invest in conventional marketing to promote business and drive traffic. Marketing outlets include trade publication ads, online banner ads and Search Engine Optimization. Marketing is critical to the success of our business and despite our social media success conventional marketing indicators point to a 54% increase in traffic within a 6 month period. This increase in traffic will come during a critical slow season (cold months) where our best seller, pedicures are not as popular. Of the requested loan amount $1500 will go towards staff training and development. Now that business has slowed it is critical to expand our service offerings in order to remain solvent. Team members will learn facial waxing, eyelash application and threading. With client wellness at the forefront of our eco-friendly business we will also be adding reflexology massages. Addition of these low expense and high profit margin services will add 31% more revenue to our bottom line within 12 months of inception. Remaining funds of $2500 will be used to add equipment for new services, purchase point of sale hardware and necessary software for accounting, client management and inventory tracking. Why are you endorsing Karla? Karla is a woman who walks the walk and talks the talk. She’s also got an eye for an upscale nail salon and beautifully presents her brand and image with the highest quality. I am endorsing Karla because she knows the object of running a successful business is being able to service the needs of the customer. That means, you must give the customer what she wants, when she wants it, and in the way that best serves her needs. The Nail Belle salon owner has figured this out and is about the business of satisfying the customer.